The Turkish ship yard Peri Yachts has been founded by a group of local entrepreneurs who are currently involved on multiple fronts. The founding members can ensure financial solidity and sustain the ship yard's activity with the know how of technological industries in which they have already been involved as recognized businessmen . Peri Ship yard has now specialized in the modern construction of high tech. composite yachts, boasting solid structures but containing the displacement factor. 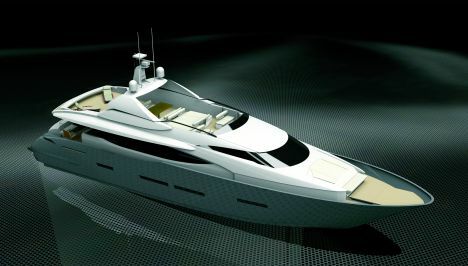 Three models are currently under construction in the Antalya ship yard, a 29 metre, a 33 and a 37 metre motor yacht. Delivery of the 29 metre in May last whereas the next one will be launched in August. The first 33 metre will be launched in July and the larger and more sophisticated 37 is scheduled for completion in spring 2008.This current fleet admiral ship is going to be surpassed by a 41 metre motor yacht not as yet under construction but already defined as far as the projects are concerned. The 37 metre has been developed over three decks plus a sun deck. The lower deck houses four guest cabins with en suite bathrooms with ample surrounding space . The crew's quarters are made up of seven births in the bows area. The bow area on the main deck is entirely taken up by the owner's suite which is very bright thanks to the ample glass panelling surround offering extraordinary visibility. The large bathroom contains a Jacuzzi bath pool. A sofa and dressing area complete the suite. Along this same deck we access to the main saloon with adjacent dining area which is entirely styled to portray a sense of continuity throughout the large and bright space. The forward area of the top deck takes in the wheel house installed in a predominating position with a leisure zone furnished with a sofa and lined with state of the art electronic systems. More sofas are to be found stern of the wheel house with armchairs, a table and a large screen that look out onto an open area of this deck towards the stern. The sun deck is located so as to enjoy a reserved almost private area geared to ensure maximum comfort, decked with sun pads, hydro-massage pool, bar corner, sofas and table. For further information about these interesting Yachts manufactured in Turkey kindly contact: Peri Yachts; Tesvikiye Bostan sok. Orjin apt. No: 15 kat:2; Nisantasi, Istanbul-Turkey; Tel. +902120240 2883; fax +90212 240 2877; e-mail info@periyachts.com; web site: www.periyachts.com. Number of births: 10 in five cabins or 12 in six. engines: 2x2.736 HP MTU 12V 4000 M90. Range at cruise speed: 900 NM. Design: Scaro. Design Engineering: Bill Dixon. Classification BV or RINA/MCA upon request.